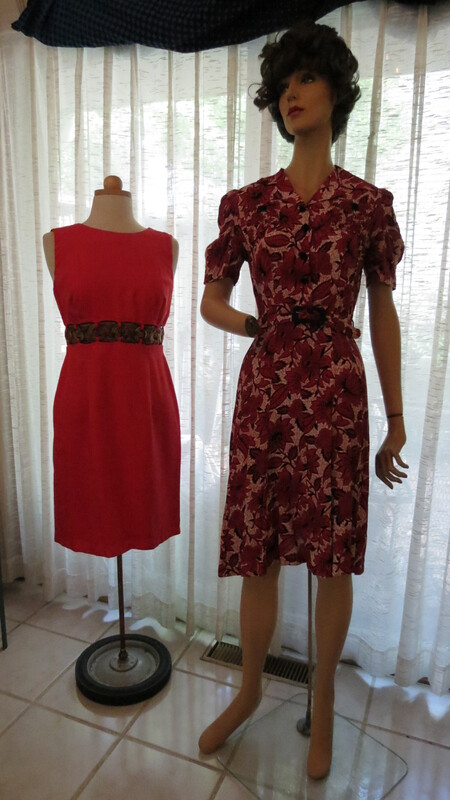 Now that Stella is part of my modeling crew, I can show more of my gorgeous dresses on more than just a hanger. Madge (bless her heart, she’s beautiful) just can’t get into many of them. These temperatures recently have kept 3-seasons garments in the spotlight! Lots to tell about these. The sheath on the left is pure mid-sixties mod. The waistline is open, held together with a row of plastic circles that show your midriff. In order to make it a little more versatile, I sewed a silk scarf into the waistline. Easy to remove, but it takes the dress from pure casual to dressy, if necessary. It’s lined and very nicely made. The printed shirtwaist is 1940’s in rayon – so fabulous to the touch and drapes like a dream! One of my absolute favorite dresses. 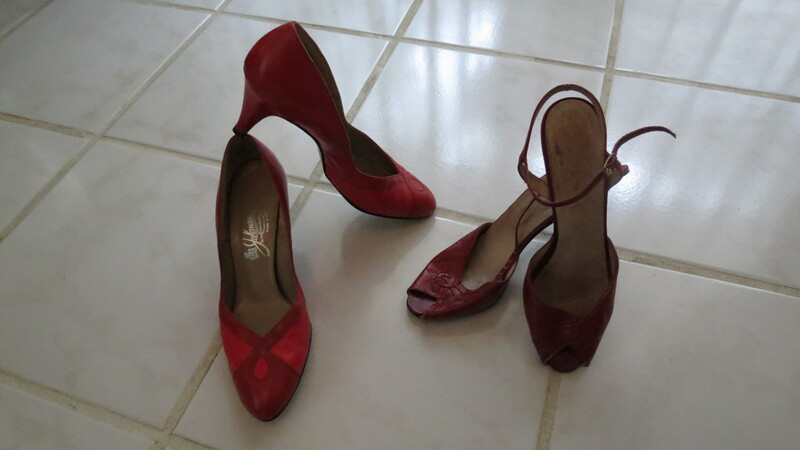 The shoes are my choice, today, of what I’d put with them. Johansen pumps from the 1960’s are great with the sheath and some ’80’s does ’40’s slingback peep-toes by NINA are perfect with the shirtwaist. Both leather, of course. 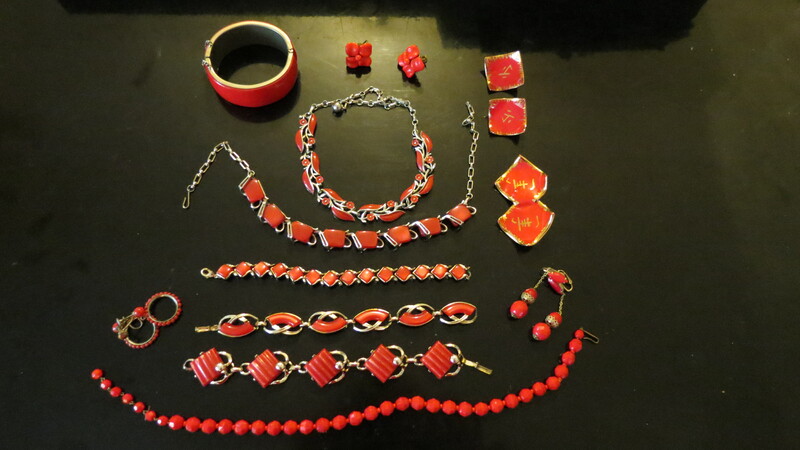 And, for the final touch, anything from this 1940’s – 1950’s assortment of neckaces, bracelets, earrings and pins would be a great addition. Posted on September 29, 2017 by Morgana Martin, the magicvintagespy. 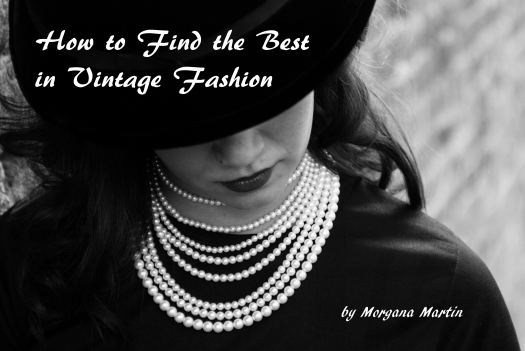 This entry was posted in accessories, blogger, bracelet, clothing, costume jewelry, day dress, dress, earrings, find, frock, jewelry, ladies, necklace, pumps, sandals, shoes, women's and tagged '40's, '50's, '60's, '60s, 1940's, 1940s, 1950's, 1950s, 1960's, 1960s, 1980's, 1980s, 40's, accessories, blogger, bracelet, clothing, costume jewelry, day dress, dress, earrings, find, frock, jewelry, ladies, necklace, pumps, sandals, shoes, women's. Bookmark the permalink.